It was our educational trip to New Delhi and as usual people had scattered all over Delhi, NCR and even upto Meerut, Simla etc. 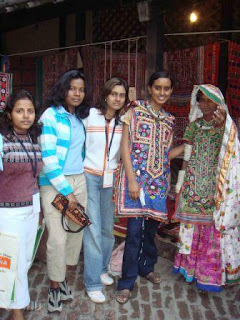 We were just 4 of us who didn’t have relatives in New Delhi and a sweet friend came to our rescue. Her grandad (he’s the bro of the Methuselah who comes in the MDH Masala ad), who belongs to Delhi booked a room in a safe, decent hotel for us to stay, located just opposite to their home, so that we could feel absolutely safe. Also, another friend ended up staying with us for 2 days and in her family friend’s place for 2 days. During our onward journey, at Nagpur to wanted to get our lunch at the famous Comessum Restaurant. With our compartment several paces away from the restaurant we got down, ran to the restaurant, got food and ran back. Few got into some compartment and walked up to ours within the train. Well, that running to and fro was worthy. The food was delicious. In our college, I knew we (whoever knew Tamizh) had given basic training in Tamil for our college mates for survival reasons. The most important word was ofcourse ‘Anna’ which means brother/bhaiya. Right from auto driver to shopkeeper to canteen cashier to literally everyone, the sentence would start with ‘Anna’ in Tamizh, followed by English… Well, few of them managed to pick up more than that and one young lady could infact count upto hundred. But I never know we had made such an impact until one of our mates called out a rickshaw puller in Delhi as ‘Anna’, and after a few moments realized that we were in Delhi and it’s no more ‘Anna’, it’s gonna be ‘Bhaiya’…!!! Well, after the initial ‘educational’ part of the trip, it was time for our own masti part of the trip. So, we planned certain things, which included shopping in Sarojini Nagar, Dilli Haat, Janpath, Rajpath and ofcourse Karol Bagh. Apart from that, we also went sightseeing at the Crafts Museum, Rashtrapathi Bhavan, and India Gate. One day, it was a fine night around 10 pm after dinner and my friend’s uncle was discussing about the several museums in Delhi much to my interest and much to all of my friends’ agony. They all gave this ‘I’ll kill you if u plan for museums’ look and gestures. When we finished our chit chats all of a sudden we planned for a rather unplanned visit to India gate at 12 midnight. 5 girls, uncle and his small little son, in a car, with the expectations that the lighting show would be there. But unfortunately the lightings are all switched off by 11 pm and we were a bit too late. But still, the area was buzzing with activities. Soft candy men, balloon vendors and ofcourse Police Men were still at work. Though we couldn’t see the amazing lightings as claimed by the localties, still it was a nice trip at 1 AM, dead night! And on our way back we stopped for an icecream as well…!!! The next day after a day’s work at Pragati Maidan, I put my request in front of ‘em to go to Crafts Museum. I knew it was a tired evening after a whole day’s hectic work at Pragati Maidan. But still, we wouldn’t come all the way to Delhi just to see Crafts Museum. So somehow I managed to convince them to accompany me to this place. Being located within Pragati Maidan, it’s not even justifiable to go without visiting this great place. 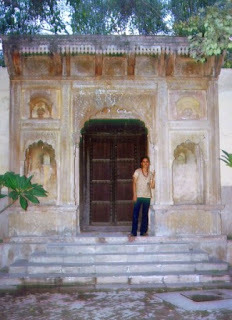 I knew about this place pretty well, coz I had visited already with my parents, few years back. This pic was taken during that visit. Whoever been to Pragati Maidan, know of its magnificient size (around 3 lakh sq. m). To walk it up is a bigggg deal. And then to top it up were the confusions of the gate no.s and hall no.s. We proceeded towards what we thought was hall no. 8 and unfortunately ended up in gate no. 8. After lots of roaming around, we finally reached Crafts Museum. 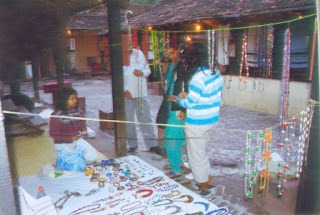 The place was awesome and my friends who initially scolded me for making them walk, now were busy shopping at the stalls put up in there of several ethnic stuff and base price. The best part of shopping here is - unlike buying ethnic stuff from other places, where hardly any money goes to the artisan, here we actually get to interact with the artisans and whatever we pay them is actually theirs without any interference of middle men. 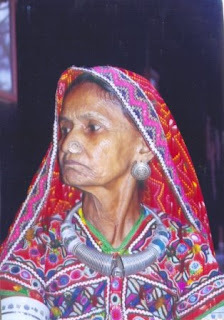 I found a lady and her husband and her daughter / daughter-in-law from Gujarat selling all those wonderful embroideries and textiles designed by them. But what awe struck me more than their textiles was, she herself, the way she had made up herself. A routine for her, an immensely awesome makeover for me. I just sat beside her and was inspecting every ornament and garment. 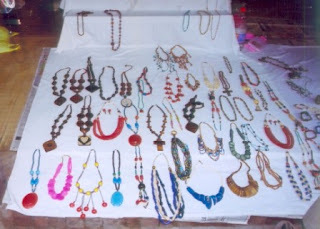 She was selling only textiles and not the ornaments and I loved her neck piece. The only option I had was to make it memorable with a pic of myself wearing all those gorgeous garments and ornaments. I just wanted to take a pic with just the neck piece. 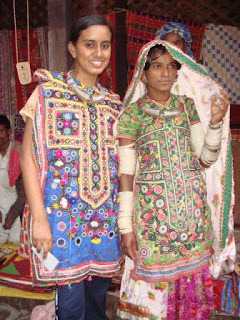 She readily gave it to me for a shot, along with an embroidered tunic to make the pic perfect. She was also ready to give the bangles and earring, but that would get tedious to remove, wear and again remove, so just the neckpiece & tunic on me for a perfect pic! 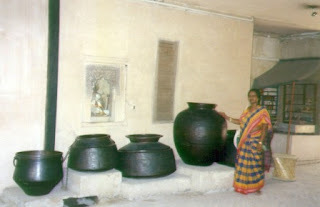 Within the museum every other craft of every other state of India are put to display. 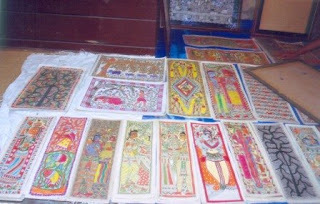 Madhubani Paintings, Pashminas, Zardozis, Kalamkari, and pottery works and metal works from all over India, are here for us to enjoy. 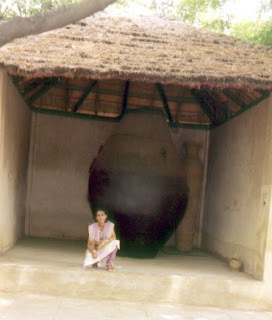 Even ancient burial pots (Moodhadhaiyar Thaazhi) of Harappan Civilization and other archeological burial sites are here. To support the ancient belief of life after death, the deceased were buried in such huge pots with food, clothing, gold and everything that is required to lead a normal life in the other world. This too is a pic taken during my last trip as well. ...the Maharashtrian village set up with 'Worli' Paintings all over the walls, and weaving setups, block printing set ups and several more. A huge ‘Temple Rath’ is placed at the centre. The textile gallery was my personal favorite though. 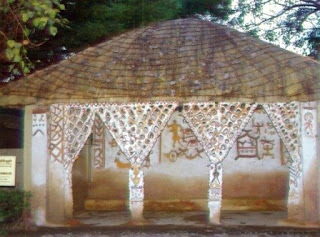 The ancient Bandhej works, done with fine needle, intricate batik works which almost look like modern day screen prints, elaborate embroideries, real gold and precious stones affixed on garments. The regal legacy of India couldn’t be shown better. I loved it. Next day I thought of going to National Museum when my friends wanted to go to India Gate again. I asked them to proceed and later join me at National Museum. National Museum is located in one of the several roads going across the Janpath (The road that joins India Gate and Rashtrapathi Bhavan), parallel to Rajpath. After their sightseeing at India Gate they called me up, I asked them to come to Museum. Thanks to those several roads, they took a wrong road and reached Vice-President’s place and called me and said, “Arey yaar, we reached Vice-President’s place… Where is the Museum..???”. Question marks flew above my head and I said “Which road did u take?”. Then asked them to ask a policeman and reach the Museum and finally they reached. The evening we ventured to PVR Cinemas in Connaught Place for ‘Honeymoon Travels Pvt. Ltd’. At the entrance we were barred by the policemen for carrying camera. He wanted to confiscate it but wouldn’t give any token or locker room or anything of that sort. Now, where would we find him in that vast multiplex after the movie? We thought about it and decided that we would give only the battery of the camera and he too accepted. About the movie – Ahem… No Comments… But thanks a group of friends who sat behind us, their commentary was the only thing worth the money we shelled out. A guy screamed “PVR…… Gimme my money back”. There was a scene in the movie about a guy who was a gay. At this point another guy commented “Yaar. Jab bhi main drunk hoon, mujhe kisi ladke ke saath math bejna yaar” (“Guys, never send me alone with a guy when I am drunk”). Whoever watched this movie would understand the comment... :-D After the movie, we laughed on those comments on our way out and almost forget the movie…!!! On our way back in the train, a friend’s mom and aunt had packed food for all. It was ‘paratha’ and ‘bread’ and ‘karela sabji’ (Karela - Bitter guard). After initial hesitation o’er ‘Karela’, I managed to risk it for the first time in my life. It was delicious and now I have no more hatred towards Bitter Guard. Another friend’s mom had prepared savories for us. Should I even say it got over before we could reach Nagpur, leave alone Chennai? 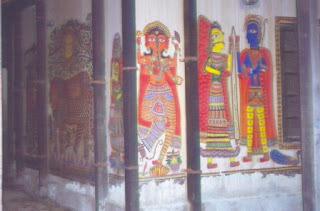 The specialty of the return journey was it was the day of Holi. We had bought colors from Delhi to make the day special but also took care not to become a public nuisance with the typical reaction “College students are always like this.”…!!! Yes, we managed to prove otherwise…!!! With Mathura ke Peda, Agra ke Peta (After my confusion and clarification between Peda and Peta. A friend started explaining the receipe of Peda when I had actually enquired about Peta) and Nagpur Orange we reached back to Chennai. Will Come soon with Haus Khas Green Park, special coverage. Wait and Watch.!!! Dedicated to Mom, Dad and all my college mates esp. to Sumegha, Megha, Asmita, Neelima, Pratima and Swagata (those involved in all these Musings). Interesting Bhusha :) Beautiful post... and your writing style RAWWWWWKS!!! Awesome writeup. Superb Pictures. And Delhi is the place where I have spent the maximum years of my life. Your nostalgic memories revive nostalgia in me too. I spent five years in Delhi for my Engineering(IIT,1966-71) and again lived there for 6 years(1997-2003.And you have visited all the nice landmarks there.The India Gate/Rashtrapati Bhavan experience beats everything. I dont see any pics of the Qutb Minar. I hope you had your fill of chaats & chole bature for which Delhi is famous. Looks like you skipped the Red Fort,Raj Ghat & Shanthi Van etc. Did you take a ride on the Metro Rail which is the latest thing to hit Delhi? Really enjoyed this post ! Qutb, Taj, Rajghat and many more places were in a visit with my parents. Will write it up in near future. Reg. food of course, Chole Bature was by default our breakfast everyday. There was a nice, small sweet corner which had delicious food in Karol Bagh. I forgot its name now. That was out breakfast and dinner place everyday. And ofcourse, Metro was our mode of transport. Amazing tour of Delhi with fantastic photos. I enjoyed reading your beautiful narration. I was in Delhi in 1968 to participate in the Independence Day celebrations as an NCC cadet and we marched from Raj Bhavan to Red Fort. We camped in Garrison Grounds for 21 days. As regards your query in my post, the photos were taken in Kochi in Kerala. Beautiful photos with the sense of culture in it. thanks for dropping but today. was a treet to talk this walk through your journeys with you today. hope you are having a great weekend! Welcome to my blog. Thanks for dropping in my blog... :) And do keep visiting often. WHERE IS THE INDIA GATE PHOTO??? And my dear, did u see the time, when we went to India Gate and the disaster that hapened thr... How do u expect me to click a pic of India gate at midnight with no lightings also...??????!!!!!!!!! !